Trezor have just released an updated model of their series of hardware wallets, with the new device has been dubbed the Trezor Model T, and is their newest flagship model. The Model T was released on the 28th of May of this year, so it is still very new. It has been described as having the legacy of the original Trezor One, but with enhanced security, intuitiveness, and ease of use. The first noticeable change after we noticed is the improvement in quality. The packaging itself is larger than the original Trezor’s box, and upon opening it features a clear plastic screen, which the device sits in. Simple instructions are also placed in a convenient location inside the packaging. The device comes with a USB type C cable and magnetic backing plate that allows you to stick it somewhere if you want the device to be fixed in place. Along with this, the Model T comes with some Trezor stickers and two small cards for writing down your recovery seed phrases. However, writing them down in a diary or notebook wouldn’t hurt as the cards are quite flimsy. The device itself bigger than the original Trezor, and weighs a little more which makes it feel more sturdy and hardwearing. The USB type C cable port is located at the bottom of the device, while a touch screen distinguishes this model from the last which featured navigation buttons. Trezor says that the device is built with a faster processor, and comes with an optional SD card slot for data encryption and for offline transaction, which they say is coming soon. There is the option for the Model T to be used with a mobile device, however a separate cable is required to use this feature. One of the key differences between the two devices is that all the security features are contained on the Trezor device itself. The Pin entry, passphrase entry and device recovery are all completed using the touchscreen. All of this is done on a computer or a mobile device with the original Trezor. 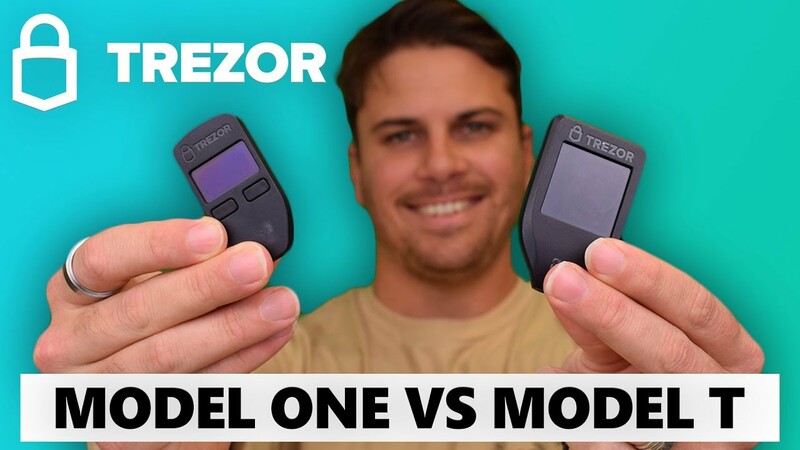 The Trezor Model T will even support a lot more tokens than the Trezor One. A few examples coming soon to this are Ripple, Monero, Lisk, Doge, Vertcoin, and other tokens not supported on the Trezor One yet. If you are using the MyEtherWallet interface, you can store any Ethereum based token anyway. This accounts for roughly 80-90% of all tokens. The device can be found on CoinStop for roughly $250 Australian, or around $186 U.S. The original Trezor One is roughly $160 Australian (about $120 U.S.).